Single On A Saturday Night is celebrating the single life and we are looking for single’s living a successful single life! Life, regardless of relationship status, should be celebrated. 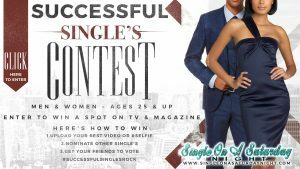 Whether you’re a lady or gentlemen if you are a Living Life as a Successful Single we’d love for you to enter our “Successful Singles Rock” competition. Successful nominees will display a dazzling combination of drive, self-confidence, integrity, willpower, passion, hardworking and style with a winning personality. Welcome to our Successful Singles Contest! We welcome you to post and share online as much as you'd like. Just click 'Upload Photo' and you can create a profile. Then share your profile online and urge your friends to join and vote for you! The contest will be online from September 15, 2016 through October 16, 2016. The winner will be the user with the most votes. You can upload up to 3 photos per entry. Duplicate entries will not be counted. In the event of a tie, the administrator will pick the final winner. All pictures will become property of ShellyShellWilliams. Privacy is very important to us, we will not share your personal information with any 3rd party. We will not use your information for marketing or advertising. The winner will receive recognition on our website and social media pages. We will also place their image in our archives as new contests are created in the future.